Robert Allen Palmer (19 January 1949 – 26 September 2003) was an English singer-songwriter, musician, and record producer. He was known for his distinctive, soulful voice, eclectic mix of musical styles on his albums, combining soul, jazz, rock, pop, reggae, blues, and sartorial acumen. He found success both in his solo career and with the Power Station, and had Top 10 songs in both the UK and the US. His iconic music videos directed by British fashion photographer Terence Donovan for the hits "Addicted to Love", "Simply Irresistible" and "I Didn’t Mean to Turn You On" featured identically dressed dancing women with pale faces, dark-eye makeup and bright-red lipstick, which resembled the women in the art of Patrick Nagel, an artist popular in the 1980s. Palmer’s involvement in the music industry commenced in the 1960s, covered four decades and included a spell with Vinegar Joe. 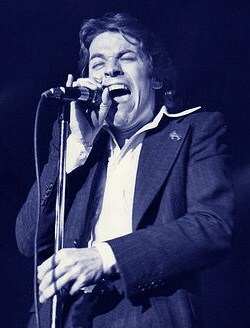 Palmer received a number of awards throughout his career, including two Grammy Awards for Best Male Rock Vocal Performance, an MTV Video Music Award, and two Brit Award nominations for Best British Male.